BREAK EACH DEMAND and ZONE TASK/ITEM INTO STEPS. To Do Lists don’t work because they don’t distinguish between things that require lots of time and effort and those that don’t. Break Important tasks (both Demand and Zone) down into the steps required to get them accomplished. · Identify WHAT steps are required to complete the task/item? · Guess how much TIME is required to complete each step. · Identify WHO needs to do or can do each step (great opportunity to delegate, get leverage here). · List the RESOURCES (materials, money, knowledge etc.) you’ll need at each step. · If needed and useful, draw a flowchart tying the steps together. SCHEDULE. Give your important tasks a place to live within your upcoming week. 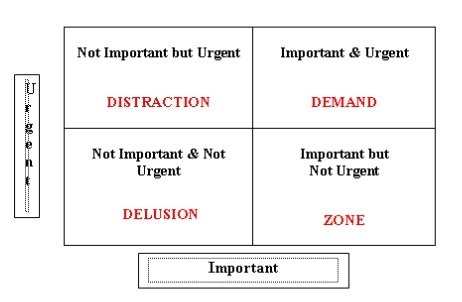 Key Concept: Assign blocks of time to your tasks. Your commitments are shown as specific periods of time instead of a line on a To Do list. · Start by blocking out appointments and meetings you have already committed to (it’s surprising how much time a simple “yes” can steal). If these items repeat from week to week, set them up as repeating appointments. Add separate times for reading e-mail, returning voice mail and planning your week. · Then, allocate times to complete specific steps identified in step 4 for your DEMAND and ZONE items. Be sure to leave gaps between the blocks of time to deal with unexpected and unplanned demands – and to account for the time we waste doing DISTRACTIONS (hopefully, you recognize by now that you should not be spending any time on DELUSIONS). You can color code the blocks of time to identify the categories you established in step 2. 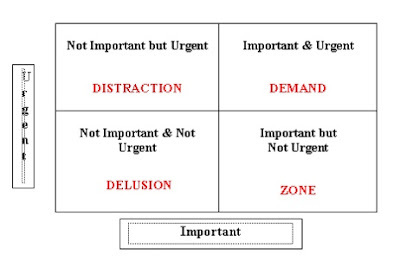 Be sure to give priority to ZONE activities: spend at least 4-6 hours per week working ON your business instead of IN you business. This is where you’ll get the biggest impact on your life. FIGHT FOR YOUR TIME. Fight yourself – don’t let DELUSIONS and DISTRACTIONS get in your way. And fight others – learn how to say no. Don’t let others steal your time. At first, your commitment to manage your time better will be challenged – by phone calls, email, text messages, clients, co-workers and family. Stay consistent for 4 weeks and you’ll be AMAZED at the impact on your life. TIP: Deal with potential disruptions by saying “Great, I’ll be with you at (specify time/day)”. There are very few things can’t be put off for a little while. REPEAT, REVIEW and RESET. At the end of each week, add new tasks, delete completed ones, reschedule tasks you weren’t able to complete and remove those that you realize are no longer worthy of your most important asset: TIME.